At Mercy Multiplied, we are very blessed to have so many volunteers pour into the lives of our residents. We are so thankful for the time and talents that these volunteers give to help the ministry. One of those volunteers is our Community Board Member, Janice Rosenthal. Janice has been supporting Mercy and volunteering in our Sacramento home since 2015. She is a monthly partner and has attended MPower and Freedom Experience. She is a print broker by trade and has a crafting business called Bella Cosa Vintage. Janice attended Mercy Wonderland in 2015 and emailed me the very next day asking to get breakfast that same week. She was totally ready to be involved and was very excited to find a local ministry she could pour her time and talent into. Janice has been a rock star ever since. Her day job as a print broker has saved us hundreds of dollars on every event we have hosted. She is always finding ways to bless us through her printing work. 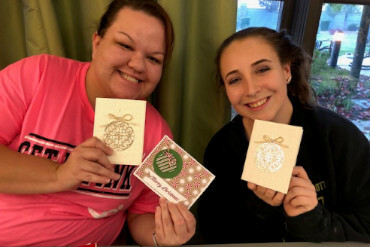 Janice and her friend Katrina Benny recently visited the home and held a card making workshop where residents learned how to craft cards. 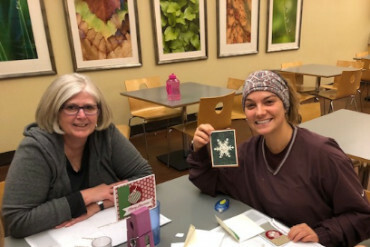 The greeting cards started when Janice brought in a box of 200 beautiful, handcrafted cards to the office for the residents to write home with, commented Kerri. We were in awe of the time and talent it took to create them. 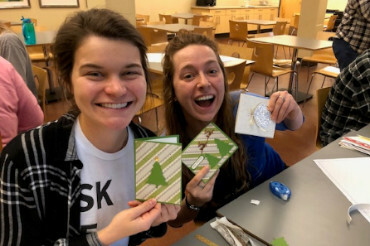 She offered to come teach the Mercy residents how to make these greeting cards and it has been a quarterly event ever since. Of course, she comes right before major holidays and the girls are able to share these beautiful cards with their loved ones. Janice adds, I’ve been making handmade greeting cards for more than 18 years, and doing card making workshops for 15 years. We were told that the girls love to write letters and send greeting cards. Of course, we really love handmade cards, so we thought helping the girls make cards for several occasions during the year would be a great way to share with them, foster their creativity, give them something fun and different to do, and love on them. Janice has a favorite saying about Mercy when she is telling others how much she loves Mercy. She calls us a “God-immersion” and loves telling others how much God has blessed her while He is blessing the Mercy girls. We are so grateful for Janice and all the ways she helps Mercy Multiplied. We are so grateful for Janice Rosenthal and her partnership with us. If you would like to learn more about how you can get involved, visit this link: volunteer at Mercy Multiplied.